Here is a photo of the silk scarf I decided to keep since it looks really nice with jeans...as you can see it is quite light, airy and is like wearing nothing...not a winter scarf. A sudden raid or military advance. A venture or an initial attempt, especially outside one's usual area: an actor's foray into politics. Yesterday, we took to the El Cariso Big Woods in the Cleveland National Forest with the Los Angeles Mycological Society. It was the Society's first foray for the 2008-2009 season. It was our first ever mushroom foray. Of all the days to foray in Southern California we chose a cold and raining day. The spoils were meager but fun was had by all. I took this fun workshop with Brecia Kralovic-Logan on off loom weaving with silk strips. We dyed various types of silk with Color Hue Dyes, tore them into strips, wove them and sewed them into place. To keep everything together for sewing we pinned the strips to plastic bags which dissolve in water. 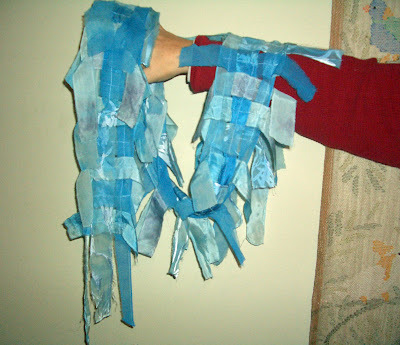 Once sewed we simply dumped the scarves in hot water and the plastic dissolved. The result was a light, airy and colorful scarf. I like to call them silk Hobo scarves since the silk strips are ripped and rough. Not like a typical silk scarf. They definately stand out when you wear one. I used the same techniques to make some Christmas presents this year. My sister helped in dyeing the silk strips. It was nice having someone else dye the silk since she selected some colors which I would not have. The Color Hue dyes are so simple to use and work like a charm on silk. We dyed the strips in plastic bags over the kitchen sink. So easy. So fun. I bought a variety of silk blanks from Dharma Trading and there were enough to make five scarves. I really wanted six scarves for my gift requirements this year so I could keep at least one. Fortunately, I lucked out at our Guild's gift exchange this year. I brought one of these hobo scarves as my contribution to the gift exchange. The gifts are wrapped without labels so no one knows who gave what. Each person selects a gift in a predetermined order; either an unopened gift or they can take one away from someone who has already opened a gift. In our group, a lot of gifts are taken way. I got to select a gift about 2/3rds of the way through the exchange. Folks were getting a bit tired so I selected my own gift in hopes that no one else would take it away. And I was indeed lucky, I actually got to take home the gift I brought. Not an easy task to accomplish with our group. Looking at the photo, the pieces look like they are made of plastic due to the reflection from the flash on the high value colors. Actually the pieces are soft and subtle with a variety of nuances from the variety of silk used in the scarves. ps J,C,P,B,M - do you have a favorite? I'll be wrapping them next week!